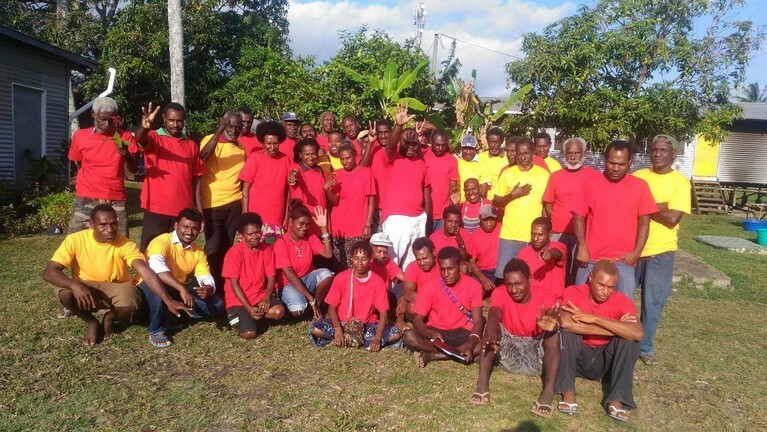 DARU, Papua New Guinea - The training for the leaders and communion ministers was held in St. Louis Marie De Montfort Parish, Daru, located in the Southern part of the Western Province PNG. In PNG we are challenged by the different Churches and denominations; so, to encourage and strengthen the faith of our people, we organized the training for the leaders through the support of our Bishop, Gilles Cote SMM. It was a highlight for the old and young prayer leaders and Communion ministers to come together to learn and know the teachings of the Catholic Church and our roles and responsibilities to become more effective leaders. The Training was held for two weeks from the 27th August to 7th of September 2018. There were 40 participants from different villages and communities who participated in the workshop. These are the topics that were taught: Basic introduction to the Bible, Basic Christian Prayers, Ten Commandments, Precepts of the Church, Sacraments, History of Salvation, Signs and symbols, Spirituality of Communion, Journey of Faith, Communion Service, Sunday Service, the Gospel of Mark, Advent/ Christmas, Liturgy, Lent/ Easter, and Homiletics. As a whole, the training was very much enriching and encouraging for the leaders. We had active collaboration and participation from the leaders. The facilitators were very good in their presentations. The leaders learned a lot and most of their doubts were clarified. We acknowledge the hard work put by our Priests Fr. Doris and Fr. Robert.